During my time in Tuscaloosa, I lived in the student ghetto of houses and apartments behind The Strip of shops, bars, and restaurants on University Boulevard near the campus. Bryce and Partlow state mental health facilities were just past the campus and group homes and halfway houses were scattered among the student housing. One particular resident, who stood out since he was always wearing a football helmet, had a routine which fascinated me. I would regularly see him start at one end of a block-long parking lot behind The Strip and walk a straight line to the other end. He would stop for a moment, turn, and walk precisely to the middle of the parking lot, stop, turn, and once again cut his previous distance in half. He would do this until the distance was so short that he would finally almost turn in a circle a few times. Finally, he would stop, mission completed, and go on his way. I watched him do this ritual on several occasions; his precision was prodigious. Breathe, contemplate, take the first step … I have recently started walking labyrinths. And even though I don’t classify walking a labyrinth the same as the helmeted guy’s routine, I do think about him on occasion when I am going through my labyrinth ritual. I have always needed solitary meditative activities for my spiritual wellness and a labyrinth seems to fulfill that need. The symbolism of the activity – walking a unicursal path to the center and back – almost demands a contemplative state of mind. Since a modern labyrinth is not (usually) a maze, there is no need to think about the curves and turns of the path – one just goes with the flow. 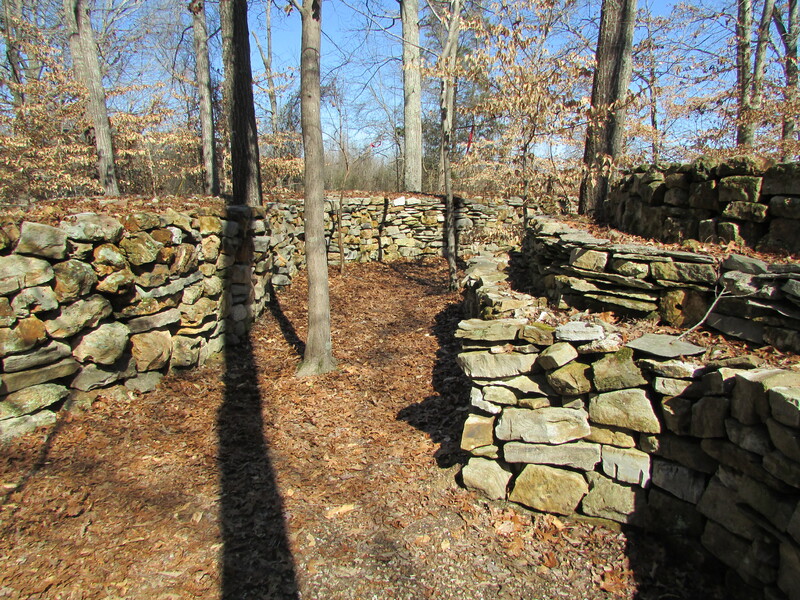 I find the experience of walking a labyrinth akin to the feeling of visiting and walking the length of Tom Hendrix’s Wichahpi Commemorative Stone Wall off the Natchez Trace Parkway near Florence; the simple activity stirs a variety of thoughts and emotions along the way. Mr. Hendrix’s symbolism of a relative’s journey on the Trail of Tears becomes entangled with the visitor’s own thoughts and emotions in the moment. The labyrinth has existed in various forms throughout cultures and history. 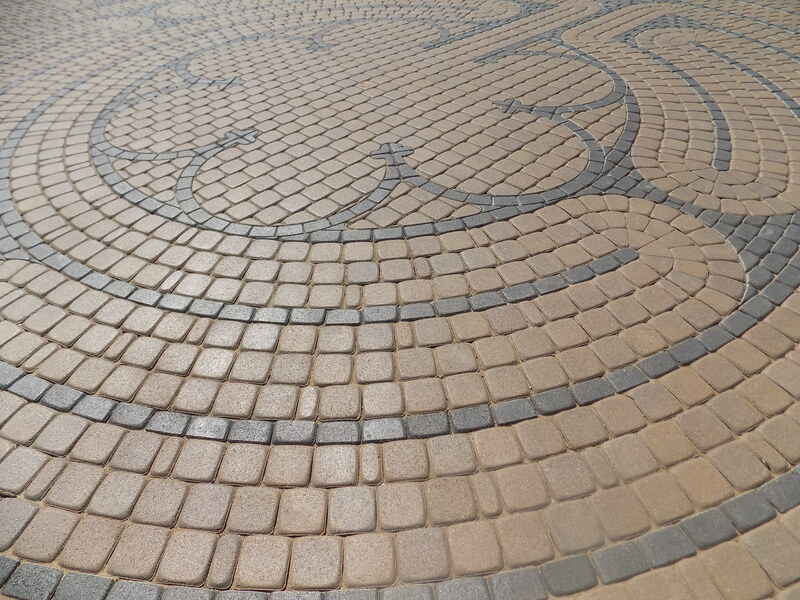 In Greek mythology, the labyrinth was a complex maze used to contain the Minotaur. It seems that the principal models for the contemporary labyrinths I have found are those found within medieval cathedrals. The labyrinth at the cathedral at Chartres is the most cited example and there are a number of versions of how it was used and what it symbolized within the medieval Christian church. Some sources assert that it symbolized the pilgrimage to Jerusalem but that seems to be a post-medieval concept. Nowadays, modern labyrinths are found at churches, hospitals, wellness facilities, educational institutions, private homes, and other locations. They seem mostly used for meditation, prayer, and focus; the symbolism is personal. There are no rules for labyrinth walks but there seem to be traditions. It is traditional to take one’s shoes off, if practical, before entering the labyrinth. Take a moment to contemplate before embarking on the path. When the center is reached, take a moment before turning around and going back to where you began; it seems traditional to leave something behind in the center – a coin, a stone. When the labyrinth is completed, turn back and look at the path you have taken. Deep breaths at key points are recommended. I have started taking the time to walk a labyrinth on my way home from work when I am able. It allows me to disconnect from the stress and the job and re-focus on other things I need to deal with. There is a website, www.labyrinthlocator.com, that helps find labyrinths in any location. Once I found the website, I was surprised at how many there are and realized that I regularly pass labyrinth locations without realizing it. The World-Wide Labyrinth Locator database lists over 5300 labyrinths in over 80 countries. Twenty-nine are listed in Alabama and I have recently learned of one more, not listed, in Birmingham. The one I just discovered is located at Trinity United Methodist Church in the Birmingham suburb of Homewood. 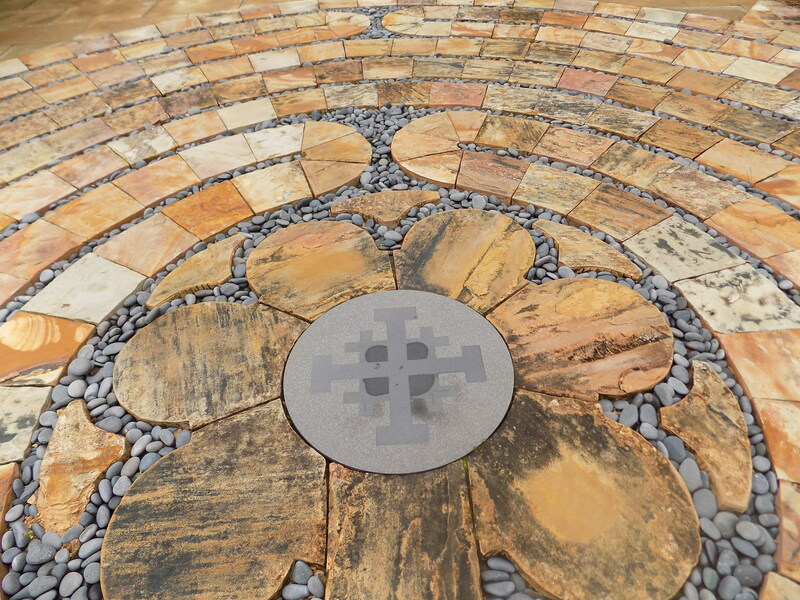 It is a part of the church’s Prayer Garden and Columbarium. 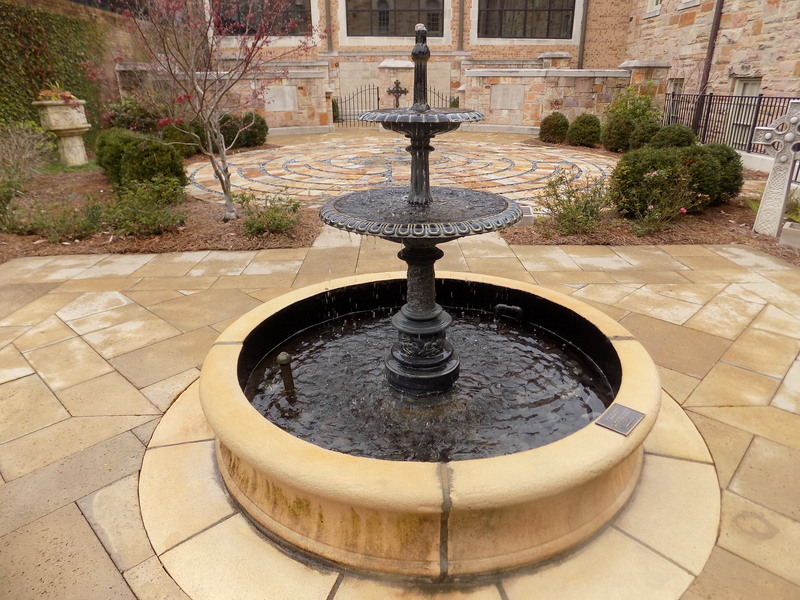 The church is on a busy road but the garden is below street level and that location, plus a trickling fountain at the entrance, filters out the street sounds and provides an added element of privacy to the space. The fact that the labyrinth is in front of a burial space makes it even more serene and introspective. Such activities center me, somehow. 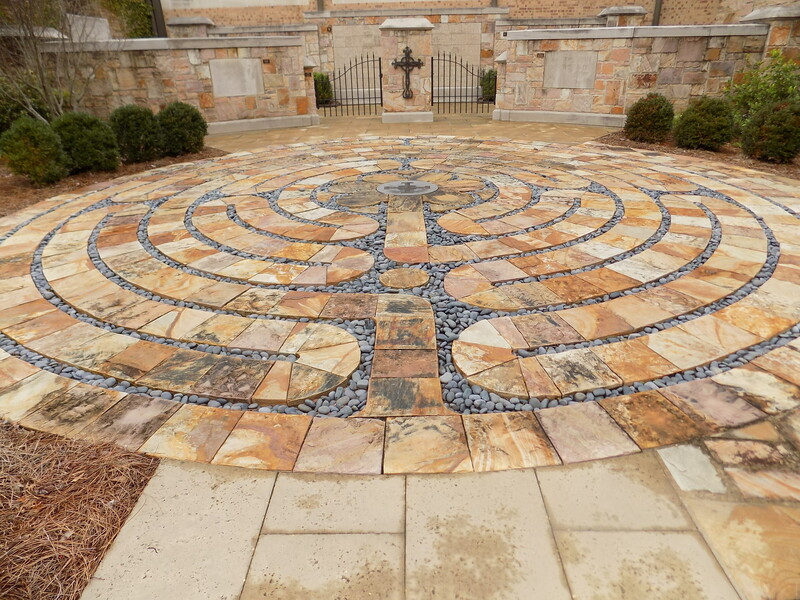 This entry was posted in labyrinths and tagged cathedral at Chartres, labyrinth in Greek mythology, labyrinths, Trinity Prayer Garden and Columbarium, Trinity United Methodist Church Homewood, Wichahpi Commemorative Stone Wall, World-Wide Labyrinth Locator on March 19, 2017 by gedwardjourney.